When we travel we absolutely love eating great food. We also love being able to stay in places where we are able to cook the foods that are around us. This really makes visiting the markets so much more enjoyable, and also gives us the chance to cook the things we have been seeing and talking about and being inspired by. With so many choices of vacation rentals and so many easy search options I urge you to take time during your trip to stay in a house, or apartment, or even an aparthotel; you can find all of these in all types of categories and prices, even in small towns, and big cities. This makes our vacations so much more enjoyable and affordable. The kitchens or kitchenettes are almost always more than adequate (only once have we had a problem and if I ever do a post on bedbugs I will be sure to mention this). Fortunately, this little kitchenette in this chalet did not disappoint, and was perfect for the four of us during our 8 night stay. We spent all of our days out from early morning, and returned at home in the evenings and were so happy with the dinners we made. I don’t recall if it had an oven but I do remember 3 burners which was perfect for brewing Swiss Coffee, making Swiss Fondue, and for these Rösti Potatoes. 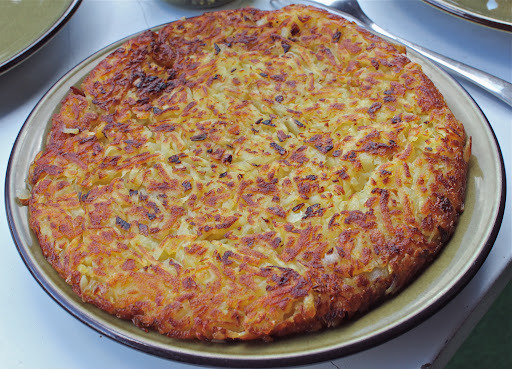 Since returning from a wonderful trip through the Swiss Alps I can now say with all certainty that I would be quite happy to one day open a shop that revolved around Rösti Potatoes. Featuring different potatoes for different textures and frying them up in a selection of fats and oils…”Truffled Potatoes Anyone?”. Offering all types of fillings and toppings: Sauteed Chanterelles or any available wild mushroom, Caviar and Creme Fraiche with freshly sliced Chives, Gravlaks and Dill Cream, Smoked Salmon, Ragouts of Braised meats like Wild Boar Shoulder… so many great seasonal variations or simply enjoy them hot out of the pan. Our guests would be filling the space awaiting their favorite, of course we would have to offer other potato items: Gnocchi with an assortment of sauces like Pesto or Brown Butter and Sage with shaved Grana Padano or for a meat lovers treat Smoked Rabbit Forest Mushrooms and Rosemary Cream. We’d have to sell “Real” Pomme Frites with an excellent ketchup. I am sure at some point I would franchise and live happily ever after…until then I offer my recipe to you. After eating these a few times it dawned on me that my favorite ones were made with pre boiled medium size fingerling potatoes. The texture is great; a crispy salty crusty outside and an impossibly creamy middle, a wonderful reason for so many to embellish with bacon and cheese. Place in a pot, cover with water, bring to a boil, simmer until just tender, drain the water, allow to cool. I usually simmer them during the morning when I make my coffee and then place them in a bowl in the fridge and than I have them ready to use within the next few days. Once they are cold, grate them through a large hole grater, set aside in a large bowl. In a saute pan heat oil, add onions and garlic, season with sea salt, sweat until translucent and sweet, mix them with the grated potatoes and season the whole thing up with salt and pepper to your liking. 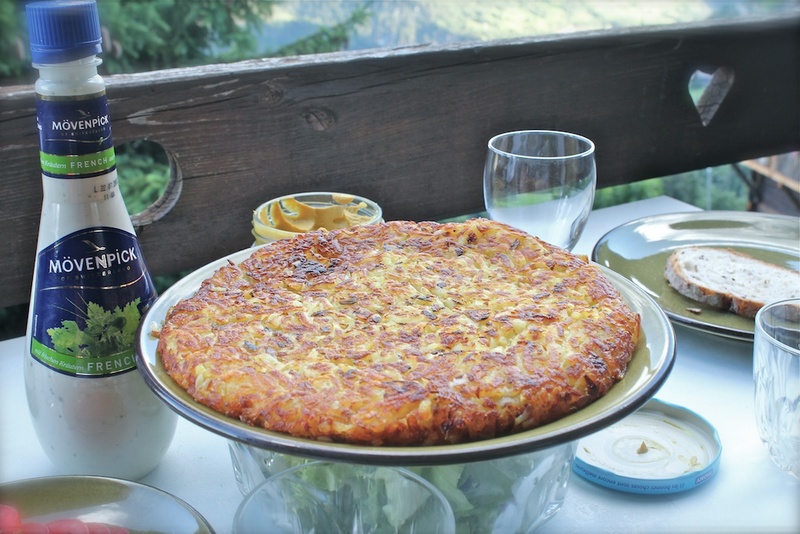 You can also hold this overnight and cook up the Rösti’s the next day! In a non stick pan that’s not too big or too small melt 3/4 of the butter over medium high heat, sprinkle in all of the seasoned potatoes and press down firmly creating a perfect uniform disc of potatoes, dot the top with the remaining butter, crisp them to your liking. I like them deep golden brown. A little splotch of dark is okay, flip them (this is my favorite part) the higher the better, and continue to cook by crisping up the other side. When heated all the way through remove to a plate, slice and serve. If you make these let me know how they come out.